Anxiety-ridden, angsty, and desperate for purpose; Generation Y is captured perfectly by the title character of Dear Evan Hansen. Evan Hansen is a senior in high school and if severe anxiety and awkwardness weren’t enough; he is absolutely friendless. It’s the first day of his senior year in high school and he still doesn’t feel like he belongs. We first meet Evan while he sits on his bed typing pep talks to himself as he rambles his thoughts out loud a mile a minute. His therapist has given him an assignment to write letters to himself. He goes to school, hoping yet terrified of running into his crush and anxious for someone to sign the cast on his arm. At the end of his first day he stands in the computer lab typing his letter to himself. No one at school signed his cast. Connor (played by Mike Faist) a fellow misfit, with a dark and tormented persona, comes into the computer lab and offers to sign Evan’s cast. He takes up the whole side of his arm with his signature and begins to leave by saying, “Now we can both pretend we have a friend.” When Connor sees Evan’s letter by accident and misinterprets the mention of his sister, Zoe, he thinks Evan was trying to aggravate him. Within a few days, Evan finds out that Connor has committed suicide and Evan’s letter to himself was found by Connor’s side at the time of his death. Connor’s grieving parents (played by Jennifer Laura Thompson and John Dossett) assumed the letter was written by Connor, to Evan. Seeing the sole signature of Connor’s name on Evan’s cast was enough for the family, including Evan’s crush, Zoe, to believe the two boys were best friends, despite always knowing that Connor had no friends. Unwilling to crush the family further, Evan goes along with the notion, innocently at first until it spirals into multiple, complex lies involving the entire school and their families. Evan, enjoying being noticed for the first time and living in the delusions of having a best friend, fights through the guilt of knowing he has deceived everyone. With a girl to impress and a hardworking single mom to make proud, Evan weighs the costs of his decisions. Benj Pasek and Justin Paul have yet again found the perfect voice and melody line for the quintessential, complicated American teenager. Steven Levenson wrote the comically sharp yet tear-jerking book. Together, they have intertwined heavy, multifaceted themes with the typical contemporary coming-of-age drama. They touch on the obsession a culture has with capitalizing on tragedy and the moral dilemma of justifying a lie for the seemingly greater good, all while simply telling the story of how a teenage boy learns to accept himself. Not to mention that, as the audience laughs at the endearing and relatable awkwardness of the protagonist, there is also a deeper empathy that is felt for him as we see the just how severe his loneliness is. Pasek and Paul have given their titular character some satisfying power ballads, like “Waiting Through a Window” being the anthem of his character. The set design, by David Korins, featured multiple screens as the backdrop with projections of various social media pages, constantly scrolling in some scenes. Matched with the sound design by Nevin Steinberg, the entire setting felt like the characters actually didn’t exist in real life but only online. This was distracting and even overwhelming, but that is exactly how it should feel. The screens are active for almost the entirety of the musical until the last scene with an intentional contrast as all the screens of media are gone. 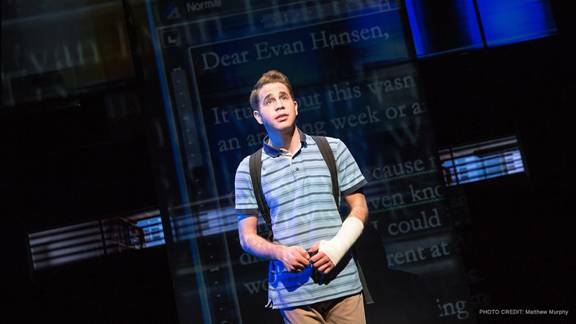 Ben Platt steals and carries the show with a complete head to toe transformation into the complicated Evan Hansen. His physicality screams nervous wreck while his monologues of panicky chatter showcase his comedic brilliance. As the show progresses his performance gets more heartbreaking and powerful as proved by the audible sobs of the audience during his finals scenes. Another stand-out performance is given by Rachel Bay Jones as Evan’s mother, Heidi. Playing the hard working and sincere single mother, Jones’ authenticity and emotional arc gave the story, driven by mostly teenagers; a gravity and complexity that makes this musical stand out from others like it. John Dossett played Larry Murphy and gave a strong performance of the wealthy, too-busy dad faced with an enormous tragedy. Mike Faist, as the mysterious and twisted Connor, has perhaps the most fascinating role as he plays not only Connor as a he was before his death, but also reappears as Evan re-imagines him to come back to have fictional conversations. Faist is certainly versatile and engrossing as his character ultimately evolves into Evan’s own conscious. 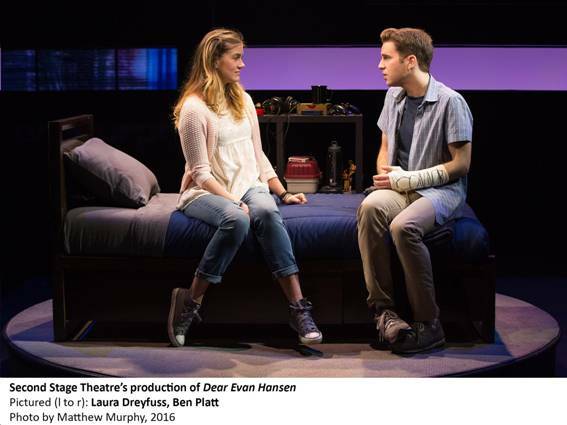 Laura Dreyfuss as Zoe, Evan Hansen’s romantic interest, gives a gripping performance and brought many audience members to tears as she sung, “Requiem” about her conflicting feelings about her brother’s death. Jennifer Laura Thompson play’s Connor’s mother, Cynthia, brought a lucid believability as her character navigates the ups and downs of mourning. The cast was completed with the fantastic Kristolyn Lloyd as the class overachiever, Alana Beck, and the hilarious Will Rolland as the amoral, fake friend, Jared Kleinman. 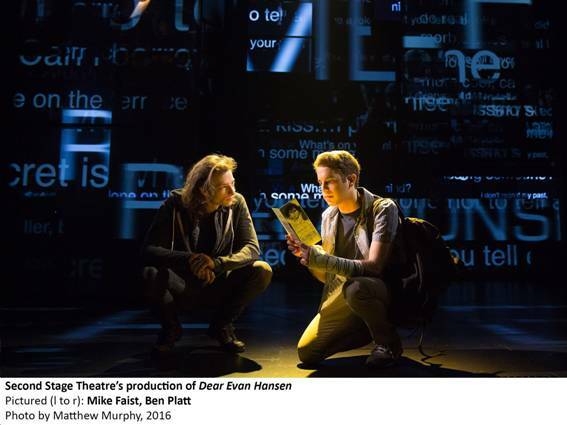 Forcefully directed by Michael Greif (Original Broadway production of Rent) Dear Evan Hansen speaks poignantly to this generation of teens and young adults with a score that is as catchy as it is empowering.